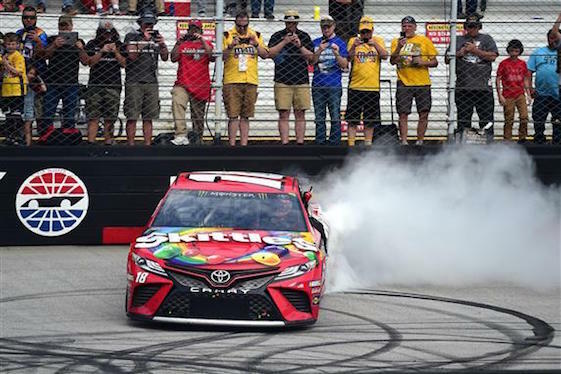 BRISTOL, Tenn. – Team Penske owned the race, but when the checkered flag waved in Sunday’s Food City 500 at Bristol Motor Speedway Kyle Busch possessed the victory that gave him 54 career wins and tied him for 10th with Lee Petty on NASCAR’s all-time Cup win list. Busch’s victory gives him eight Bristol wins, making him the winningest active driver at the high-speed, half-mile track. It also makes him the first driver in 27 years to produce top-10 finishes in the season’s first eight races. The last driver to accomplish that feat was Terry Labonte. With the victory, the 33-year-old Busch also continued his family’s win streak at the Tennessee speedway. Kyle has now won three of the last four Bristol races with his older brother, Kurt, winning the other one last August. Kurt finished less than a second behind his brother Sunday and admitted to him in victory lane that he would have wrecked him for the win if he could have gotten close enough. Sunday’s victory was extremely satisfying for the Joe Gibbs Racing team which had to fight back from a lap 2 accident that eliminated Aric Almirola and also involved Ricky Stenhouse Jr., William Byron and Ryan Preece. At the time, crew chief Adam Stevens told Busch his Toyota wasn’t severely damaged. Busch never lost a lap, but he found himself in a tough situation. While Busch fought his way back to the front, Team Penske gave the appearance that the race would be settled among that organization’s three drivers as they led a total of 344 laps. Ryan Blaney led the most, setting the pace on three occasions for 158 laps, while teammate Joey Logano was out front five times for 146 laps. Brad Keselowski led twice for 40 laps. However, when the 11th and final caution period was triggered with 20 laps remaining, the race’s complexion changed. The three Penske drivers pitted for fresh tires and the Busch brothers didn’t. When the race restarted with 14 laps remaining, the fresh tires didn’t provide the advantage expected and Logano had to settle for third and Blaney fourth. Keselowski incurred a pass through penalty on the restart for disobeying a NASCAR request to allow Ryan Newman’s Ford in front of his. That left him finishing 18th. After eight races this season, Chevrolet remains winless, and only two organizations have visited victory lane – JGR and Team Penske.